Hauskaa lauantaita, tervetuloa viikon Allsorts haasteen pariin! Tämän viikon emäntänä häärin minä ja valitsin aiheeksi nauhat ja rusetit! Viikko sitten näitte vähän vastaavat kortit, vähän eri muotoja tällä kertaa. Hi; Happy Saturday, it's time for a new Allsorts Challenge! It's my time to be hostess this week and I chose the theme " Ribbons and Bows". Our sponsors are Crafty Ribbons and Jiggery Makery. I have two quite similar DT cards, now stamped on Spellbinders Oval Majesty die cut. 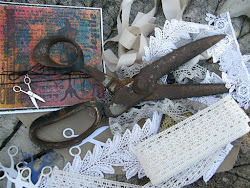 Stamp: Penny Black "holly tweet"
Lace, seam binding ribbon and bow, berries, pearls. 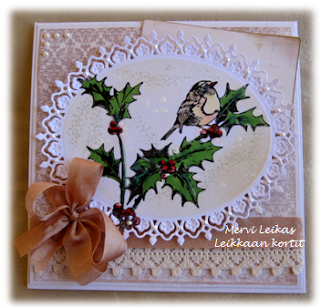 A lovely Robin image Mervi and can't choose a fav from your two cards. Many thanks for a super theme. Both of your cards are lovely!! Thanks for joining us at Make My Monday! 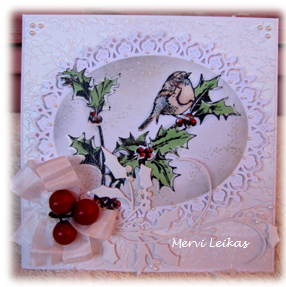 Beautiful card Mervi! Love the image and design! Two lovely cards and I love the image and that fabulous die. Beautiful image and coloring- thank you for joining us at Creative Knockouts. Valtavan suloinen ja kaunis kortti! They're lovely, beautiful image and love the design of the die cut! These are gorgeous Mervi, love your designs. Absolutely gorgeous cards. Thanks for sharing them with us at Make My Monday.